Measuring the neurological problems in mice with ataxia-telangiectasia (A-T) is a critical step in analyzing drugs that could be used to treat this disease in humans. Unfortunately, this has been an enormous challenge for scientists because the neurological defects are so subtle in A-T mice. To address this challenge, the A-T Children’s Project funded a Boston based company, Mouse Specifics, Inc., to assess the gait of A-T mice as they walk using DigiGait, a sophisticated gait imaging and analysis system developed by the company. A-T and control mice on three different genetic backgrounds were analyzed with the DigiGait System weekly for three months, and monthly thereafter out to one year. 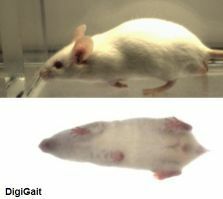 Preliminary results demonstrated that significant gait disturbances existed in the Atm deficient mice. For more information on the DigiGait Imaging System and other services provided by Mouse Specifics, Inc. please visit their web site. The genetically diverse A-T mice used in these studies were generated by Mike Weil, PhD (Colorado State University) as a research grant funded by the ATCP. Any investigators interested in mice carrying the Atm knockout allele (tm1Awb) on one of three different background strains – C57BL/6J, A/J or BALB/cByJ – should contact the Jackson Laboratory.